Dave F, Patrick O, Brian, Dave E, Lizz, and Robert (his new fire scene Double) provided modules. We typically had four trains running, with more parked in sidings and the yard. rows of modules. Looked good! some entertainment debating floor space with Dave F! Atlantic City parkway exit the sun broke out!! Mike M and Dirk, got to work. could take a group photo. numerous interesting modules from members of other clubs. 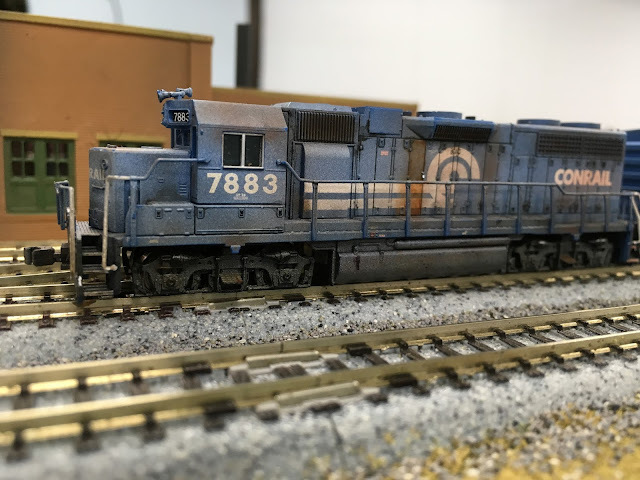 trains running at once (6 DCC)! Sunday was crowded! I think that Frank ran more trains than the next three operators combined!! 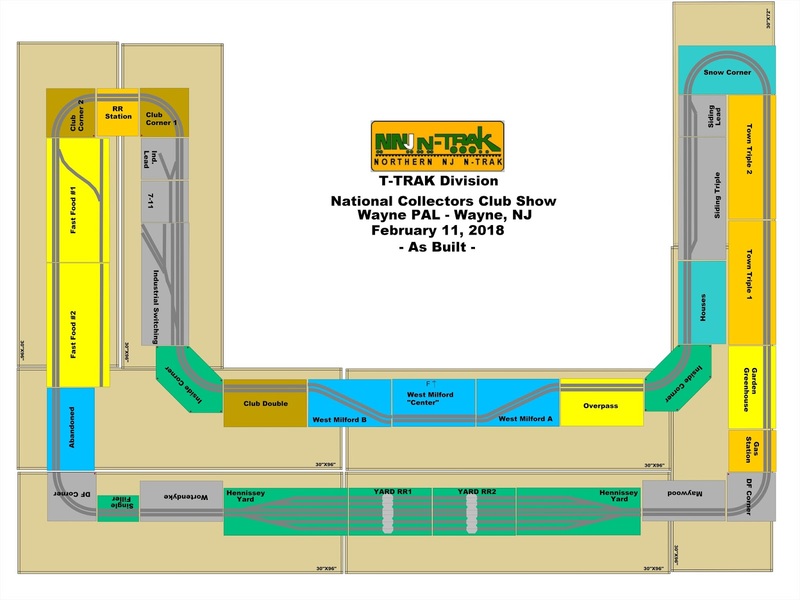 The T-trak layout belonging to the 4-H members has seen significant progress since last year. Setup started on time at 7:45, with a good turnout of members. 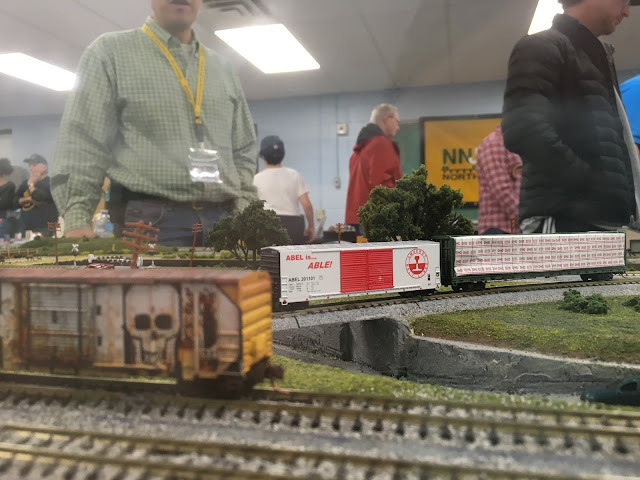 Although Dave & Phil had to do some quick modifications to the layout when we saw that the O scalers had taken more space than usual, we were still running at 9:17, when a brief "Golden Spike" ceremony was held as Mike W connected the last two modules. 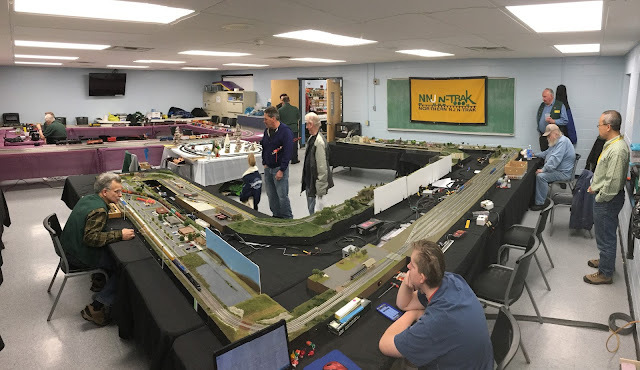 We had already cleaned the track, connected the DCC, powered up, and test run, so trains were running immediately. Seven people brought modules (around 33 in all). Lizz, our newest member, premiered her winter themed endcap in the layout. At times there were at least six trains running, with more waiting parked in the yard and on sidings. A few minor mechanical issues. No electrical issues! As Brian mentioned, we needed to change the layout on the fly, and this is the "as-built" plan. Click HERE for additional photos from Dave E.